Heat pumps have the ability to move heat energy from one environment to another, and in either direction. This allows the heat pump to both bring heat into an occupied space, and take it out. In the cooling mode of a heat pump works the same as an ordinary air conditioner (A/C). A heat pump uses an intermediate fluid called a refrigerant which absorbs heat as it vaporizes and releases the heat when it condenses. It uses an evaporator to absorb heat from inside an occupied space and rejects this heat to the outside through the condenser. The refrigerant flows outside of the space to be conditioned, where the condenser and compressor are located, while the evaporator is inside. The key component that makes a heat pump different from an A/C is the reversing valve. The reversing valve allows for the flow direction of the refrigerant to be changed. This allows the heat to be pumped in either direction. In heating mode the outdoor coil becomes the evaporator, while the indoor becomes the condenser which absorbs the heat from the refrigerant and dissipates to the air flowing through it. The air outside even at 0 °C has heat energy in it. With the refrigerant flowing in the opposite direction the evaporator (outdoor coil) is absorbing the heat from the air and moving it inside. Once it picks up heat it is compressed and then sent to the condenser (indoor coil). The indoor coil then rejects the heat into the air handler, which moves the heated air through out the house. In cooling mode the outdoor coil is now the condenser. This makes the indoor coil now the evaporator. The indoor coil is now the evaporator in the sense that it is going to be used to absorb the heat from inside the enclosed space. The evaporator absorbs the heat from the inside, and takes it to the condenser where it is rejected into the outside air. Since the heat pump or refrigerator uses a certain amount of work to move the refrigerant, the amount of energy deposited on the hot side is greater than taken from the cold side. One common type of heat pump works by exploiting the physical properties of an evaporating and condensing fluid known as a refrigerant. 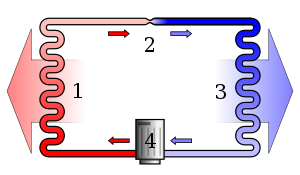 A simple stylized diagram of a heat pump's vapor-compression refrigeration cycle: 1) condenser, 2) expansion valve, 3) evaporator, 4) compressor. The working fluid, in its gaseous state, is pressurized and circulated through the system by a compressor. On the discharge side of the compressor, the now hot and highly pressurized vapor is cooled in a heat exchanger, called a condenser, until it condenses into a high pressure, moderate temperature liquid. The condensed refrigerant then passes through a pressure-lowering device also called a metering device like an expansion valve, capillary tube, or possibly a work-extracting device such as a turbine. The low pressure, liquid refrigerant leaving the expansion device enters another heat exchanger, the evaporator, in which the fluid absorbs heat and boils. The refrigerant then returns to the compressor and the cycle is repeated. In such a system it is essential that the refrigerant reach a sufficiently high temperature when compressed, since the second law of thermodynamics prevents heat from flowing from a cold fluid to a hot heat sink. Practically, this means the refrigerant must reach a temperature greater than the ambient around the high-temperature heat exchanger. 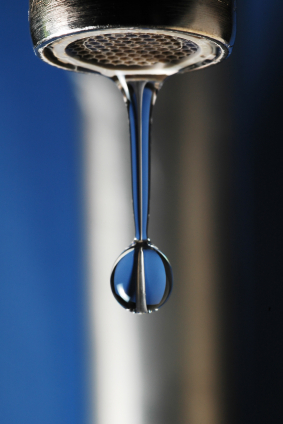 Similarly, the fluid must reach a sufficiently low temperature when allowed to expand, or heat cannot flow from the cold region into the fluid, i.e. the fluid must be colder than the ambient around the cold-temperature heat exchanger. In particular, the pressure difference must be great enough for the fluid to condense at the hot side and still evaporate in the lower pressure region at the cold side. The greater the temperature difference, the greater the required pressure difference, and consequently the more energy needed to compress the fluid. Thus as with all heat pumps, the Coefficient of Performance (amount of heat moved per unit of input work required) decreases with increasing temperature difference. Insulation is used to reduce the work and energy required to achieve and maintain a lower temperature in the cooled space. Many heat pumps also use an auxiliary heat source for heating mode. This means that, even though the heat pump is the primary source of heat, another form is available as a back-up. Electricity, oil, or gas are the most common sources. This is put in place so that if the heat pump fails or can't provide enough heat, the auxiliary heat will kick on to make up the difference. Geothermal heat pumps use the ground as a heat source and sink and water as the heat transport medium. They work in the same manner as an air to air heat pump, but instead of indoor and outdoor coils they use water pumped through earth materials as a heat transfer medium. These are very eco-friendly and are a cheaper alternative in the long run due to lower operating cost. Operating costs can be further reduced by storing summer heat in the ground for use during winter, and (for larger buildings requiring lots of air conditioning) by storing winter cold underground for use during summer. A number of sources have been used for the heat source for heating private and communal buildings. Most commonly, heat pumps draw heat from the air (outside or inside air) or from the ground (groundwater or soil). The heat drawn from the ground is in most cases stored solar heat, and it should not be confused with geothermal heat, though the latter will contribute in some small measure to all heat in the ground. Other heat sources include water; nearby streams and other natural water bodies have been used, and sometimes domestic waste water which is often warmer than the ambient temperature. Air source heat pumps are relatively easy (and inexpensive) to install and have therefore historically been the most widely used heat pump type. However, they suffer limitations due to their use of the outside air as a heat source or sink. The higher temperature differential during periods of extreme cold or heat leads to declining efficiency, as explained above. In mild weather, COP may be around 4.0, while at temperatures below around −8 °C (17 °F) an air-source heat pump can achieve a COP of 2.5 or better, which is considerably more than the energy efficiency that may be achieved by a 1980's heating systems, and very similar to state of the art oil or gas heaters. The average COP over seasonal variation is typically 2.5-2.8, with exceptional models able to exceed 6.0 in very mild climate, but not in freezing climates. (2.8 kW). At least two manufacturers are selling heat pumps that maintain better heating output at lower outside temperatures than conventional air source heat pumps. These low temperature optimized models make air source heat pumps more practical for cold climates because they don't freeze to a stop that quickly. Some models however, defrost their outdoor unit electrically at regular intervals, which increases electricity consumption dramatically during the coldest weeks. In areas where only one fossil fuel is currently available (e.g. heating oil; no natural gas pipes available) these heat pumps could be used as an alternative, supplemental heat source to reduce a building's direct dependence on fossil fuel. Depending on fuel and electricity prices, using the heat pump for heating may be less expensive than fossil fuel. A backup, fossil-fuel heat source may still be required for the coldest days. Ground source heat pumps, which are also referred to as Geothermal heat pumps, typically have higher efficiencies than air-source heat pumps. This is because they draw heat from the ground or groundwater which is at a relatively constant temperature all year round below a depth of about thirty feet (9 m). This means that the temperature differential is lower, leading to higher efficiency. Ground-source heat pumps typically have COPs of 3.5-4.0 at the beginning of the heating season, with lower COPs as heat is drawn from the ground. The trade off for this improved performance is that a ground-source heat pump is more expensive to install due to the need for the digging of wells or trenches in which to place the pipes that carry the heat exchange fluid. When compared versus each other, groundwater heat pumps are generally more efficient than heat pumps using heat from the soil. Their efficiency can be further improved, by pumping summer heat into the ground. One way is to use ground water to cool the floors on hot days. Another way is to make large solar collectors, for instance by putting plastic pipes just under the roof tiles or in the tarmac of the parking lot. The most cost effective way is to put a large air to water heat exchanger on the rooftop. Heat pumps are only highly efficient when they distribute produced heat at a low temperature, ideally around or below 32 °C (90 °F). Normal steel plate radiators are no good: they would need to have four to six times their current size. Underfloor heating is the ideal solution. When wooden floors or carpets would spoil their efficiency, wall heaters (plastic pipes covered with a thick layer of chalk) and piped ceilings can be used. Both systems have the disadvantage that they are slow starters, and that they would require extensive renovation in existing buildings. The alternative is a warm air system in which water runs through a ventilator driven water to air heater. Such a thing can either complement floor heating during warm up, or it can be a quick and economical way to implement a heat pump system into existing buildings. Oversizing them reduces their noise. To efficiently distribute warm water or air from a heat pump, water pipes or air shafts should have significantly larger diameters then in conventional systems, and underfloor heaters should have much more pipes per square meter.